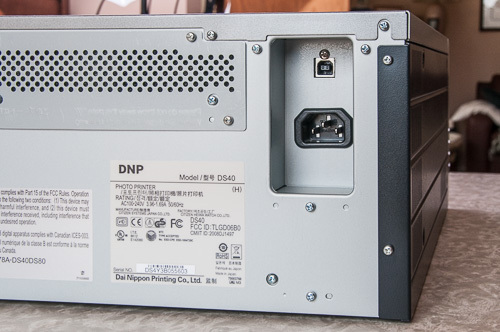 The UPS delivery soldier marshalled the DNP DS40 from Dai Nippon up the stairs as if it were a child's casket. "Is this the right address?" he pleaded. We confirmed it was. He exhaled in gratitude, crumbling on his knees. "Good. Man, that's heavy!" He rolled back down the steps, crawled to the truck and after recuperating for a while, was back on the road. We scratched our head and went back in without the printer to pay our medical care premium. When that was covered, we ran a dolly out to the foot of the stairs, slide the coffin down to it and rolled the thing into the bunker. DNP, which acquired Sony's commercial photo printing division in 2011, considers the small DS40 a portable printer, happy to attend events with you. But we're with the UPS driver. The Canon Pro-1 is 61 lbs. but is light as a feather compared to the 30 lb. DS40. DS40. It doesn't look heavy but it's built like a tank. We could carry nothing but the DS40 and we couldn't carry it far. It isn't portable in the English sense of the word. Which is too bad because we would have taken it everywhere. 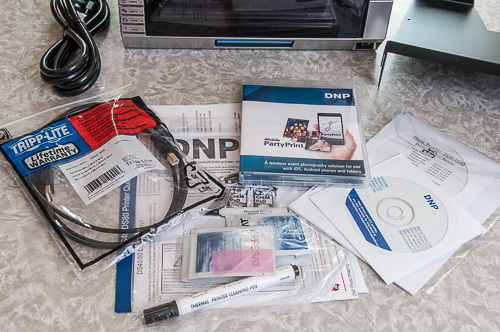 First, DNP also offers a three-year advance exchange service contract for the DS40 that provides an exchange unit via two-day shipping and covers 10 percent of the cost of parts and labor for three years of 125,000 4x6 prints. Second, note that the only way to get data to the DS40 is via the USB port. And that port is not PictBridge compatible. So in addition to the DS40, you'll need to bring along a laptop with the DS40 driver and color profiles installed to use it on location. Rear View. Just a USB port and three-prong power connection. Note the robust construction. The DS40 is not AirPrint compatible. And there is no iOS or Android printer app for the printer either. DNP does offer a Photo Party Printing application for Windows and a hot folder utility that can use the laptop as a wireless printing kiosk but because the printer only handles a standard size print with no frills, we were surprised (well, disappointed) to find no laptop-free wireless option. That would have made it a big hit at weddings and parties. As it is, anybody who wants to print from their device has to install the Party Print app for iOS or Android, which merely transmits images to a Windows-only watch folder. 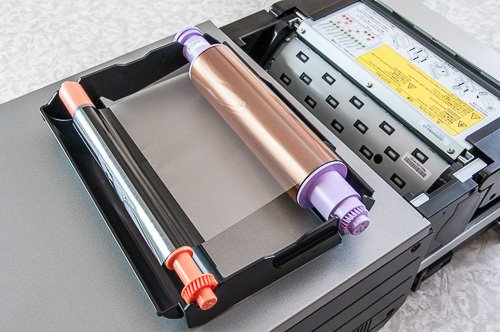 Finally, although the specifications don't point it out, the printer includes a trimmer so it can deliver full-bleed images at any of the final sizes it supports. A small tray in front collects the trimmed paper so you might never know. Confused? So were we. But here's the trick. 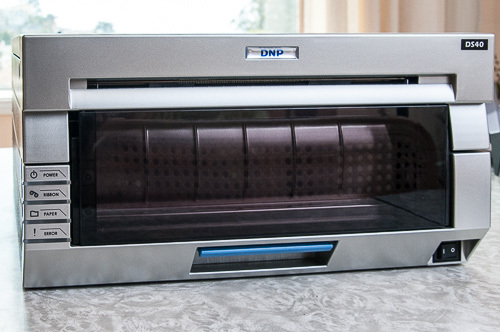 DNP sent us the first option, the DS40 4x6 and we were able to print borderless 4x6 prints as well as borderless 5x7 and 6x8 prints on the same roll. Media. Versatile roll paper is used to print in three sizes. 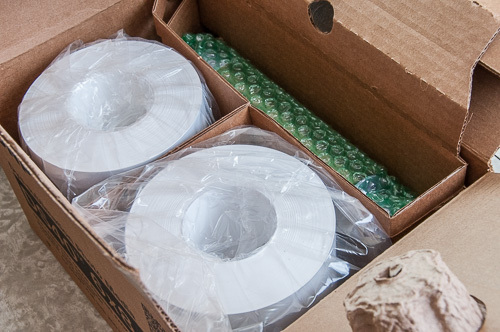 Ribbon is bubble wrapped. The driver offered an option to print 6x9 prints, a European preference apparently, but that failed to print with the driver we installed. Why you would want a perforated roll when the printer itself neatly trims the prints? DNS told us, "The perforated paper is for event photographers who want to use the small perforated section for a coupon, advertisement for their services or even a de facto business card with their contact information." The dye ribbon has cyan, magenta and yellow dye panels plus a clear coat. On HiTi printers the clear coat is optional, primarily to let you print in reverse and slap the paper on a mug to transfer the dyes. Ribbon. Three colors and a clever clear coat. On the DS40 the clear coat protects the dyes once they have been transferred to the print. But it also provides two options for the print's texture. Normal application creates a glossy finish but with additional heat applied to the layer, a matte finish is created. The driver consequently lets you select matte or glossy finishes. This works very well. The matte finish is in fact non-glossy. The dye panels on the ribbon restrict the size of the print you can make. So you can't print panoramas of 18 inches, say, because the dye panel only extends about eight inches. But if you are printing multiple 4x6 prints, you'll notice they come out two at a time as the full panel is used. We didn't need to use the cleaning kit itself in several months of testing despite opening the unit repeatedly. That behavior did deposit a spec of dust on the print head which caused a white line on prints. But it was easily fixed with a short blast of compressed air. The large metal tray's mounting tabs were bent inward on arrival so they would not slip into the printer. It was easy enough to straighten them out, however. No special tools required, just some persuasion. Contents. Two trays, software, cables and a cleaning kit with pads and pen. We downloaded the current drivers for the Mac from the Drivers & Tools page. That page also has the current color profiles, which we installed. Note that the download page claims the DS40 driver is compatible with Mavericks but you'll find the ReadMe document has not been updated. We did install it on Mavericks (10.9) and Lion (10.7). DNS provides a separate driver for Tiger (10.4), which we also installed. Yosemite (10.10) had not been released during the bulk of our testing over several months but we have since installed the current drive on Yosemite and successfully made prints on the DS40 with it. We're waiting for the first update to Yosemite before installing it but expect to try the driver on it before we complete this review. We'll cover both the hardware and software installation in our next installment of the review, which we plan to publish early next week.